Their three older sons all took care of the sheep. 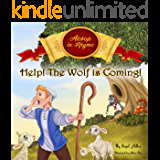 Who was Aesop, and why are his fables famous all over the world? In fact, very little is known about this mysterious Ancient Greek figure. He is thought to have been a slave originally from Africa, but even that isnâ€™t known for certain. But his stories, with their talking animals and simple moral lessons, have been popular for thousands of years. They have been translated into almost every language and were among the first books to be printed when the printing press was invented in the 1400s. The most famous Aesopâ€™s Fable is probably the story of The Hare and the Tortoise, with its message that â€œslow and steady wins the race.â€ Children everywhere have grown up loving these delightful short tales, learning and growing through their bond with these timeless classics. I grew up enjoying many of Aesopâ€™s fables and Iâ€™m excited to share them with you here in my own style, a little more contemporary and told in rhymes to make them fun to read and listen to. I hope you and your kids will love sharing these stories and learning from their messages just as much as I always have.